This film has been produced with the help of a group of Intersteno competitors in Paris, coming from Belgium and the Czech Republic. 23 wonderful women whose names starts with an “O” (for the ancient Mari people it is the letter of the sun) have enlightened the grey sky above Rome. They are the Celestial wives of Alexey Fedorchenko’s film, which was projected yesterday together with 1942 by Feng Xiaogang, a tragic event in the Chinese history which has been concealed for too long. An anthropologic film and an epic one which were welcome by the audience with great interest and consent. However, the one which was the center of yesterday’s attention is Populaire, by Régis Roinsard, a film on the typing machine and on the ability of given women to type faster than light. In the computer era, it is a sort of revenge for a forgotten art recalling the Fifties thanks to a gorgeous couple, the bad-tempered Romain Duris and the wonderful Déborah François, the new Audrey Hepburn turned blonde. Her race to become the fastest typist in the world excited the audience who warmly applauded it in an unexpected way. This success recalled that of The Artist, who won the Palm D’Or in Cannes. But Populaire is not competing for the final prize, because here comedy is still considered as a minor genre, an ancillary one. In the movie Rose dreams of gaining her freedom by becoming a secretary, a fashionable profession at that time. An Italian song even dedicates to this profession a popular cha-cha-cha. 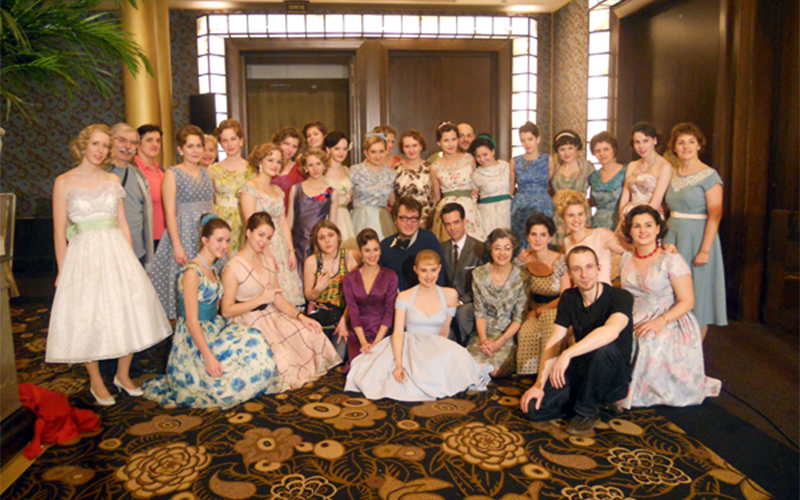 The photo shows the Czech Group of competitors dressed for the shots.